8, 1857, the elder of two sons born to John J. and Dorcas D. (Cole) Joyner. His brother, Grove O., also lives in Broken Bow. Mr. Joyner grew to manhood in his native state, and received his elementary education in local schools. Later he attended Cincinatus Academy, and was for a time a student in the state normal school at Cortland, New York. On March 12, 1879, Mr. Joyner was married at Cincinnatus, New York, to Miss Emma A. Robbins, a native of New York , where she had been a teacher before her marriage. Mr. Joyner himself had taught several years in the New York schools in early manhood, and in 1878 entered the journalist field, editing the Cincinnatus "Register." In May, 1880, Mr. Joyner brought his wife and their daughter to Nebraska, remaining in St. Paul, Howard county, until the spring of 1881. In 1880, in company with his father, he made a trip into Custer county, and both took a filing on land, the son securing one hundred and sixty acres on the southwest quarter of section thirty-one, township eighteen, range twenty-two, and in the following spring, moved to his place, but six months later returned to St. Paul, where he served for a time as deputy county clerk. In 1887, Mr. Joyner was appointed deputy county treasurer, and later again entered the newspaper field by editing the "Republican" of Broken Bow. He served two years as cleric in the United States land office, and for seven and one-half years was manager of the central elevator. He has served as deputy under three county treasurers: W. C. Bedwell, Walter A. George and John E. Cavance, giving valuable service in this connection. He is one of the best known men in the county, and in early days passed through the experiences of frontier life, meeting all discouragements bravely and unfalteringly. He has been identified with the best interests of his county and state, and is recognized as one of the county's most public-spirited citizens. Three children have been born to Mr. Joyner and Wife: Winnifred L., in Lincoln; Harold R., married, and living in Broken Bow, has one child; one child who died in infancy. Mrs. Joyner is a daughter of Horace and Lucretia (Matthews) Robbins. Her father, a native of Greene, New York, was of Puritan stock, and died in his native state in 1889. The mother, also a native of that state, is of Scotch extraction, and is now living at her birthplace, Cincinnatus. One daughter lives in New York. E. A. Harrsch, an enterprising and prosperous farmer of Knox county, Nebraska, owns one of the fine and valuable estates in the county. He is one of the pioneers of this region, classed among the leading old settlers of his locality, who has watched the growth and progress of this part of the state of Nebraska from its early settlement. Mr. Harrsch resides on section thirty-five, township thirty-one, range eight, and has a comfortable home and pleasant surroundings. Mr. Harrsch is a native of Germany, his birth having occurred in that country in 1849, and is the son of Adolph Harrsch, who was also a native of Germany, being born in Wurtemberg in 1802. When but a small boy, our subject, with his parents came to America, and remained until he reached the age of nine years. His parents and family, including our subject, then went back to Germany, where they remained ten years. When Mr. Harrsch had attained the age of eighteen years, he migrated a second time to the United States. In 1869, Mr. Harrach joined Company D, Twenty-second United States Infantry, at Fort Randall, and served five years. In 1873, Mr. Harrsch came to Knox county, Nebraska, and the following year, took up a homestead in section thirty-five, township thirty-one, range eight, on which land he built a log house. When this homestead was taken, he was still in the regular army, on detached service, and did not settle on the claim until after he was discharged. He received his discharge in November, 1874. Mr. Harrsch had a discouraging time the first year of his residence on the homestead, the grasshoppers destroying his entire crops. Several years after locating on the place, he took a tree claim. Mr. Harrsch is now located as before stated, in section thirty-five, township thirty-one, range eight, where he has one of the finest farms in the country, with a good spring of water right at his door. He has had discouragements and crop failures since locating here, among other experiences having been hailed out in 1892, and the crops were a failure again in 1894, but through it all he has prospered, and now owns four hundred and sixty acres of fine land, and forty acres of trees, this being the largest acreage of trees in this part of the county. In 1882, Mr. Harrsch was united in marriage to Miss Anna Gesnitzer, and Mr. and Mrs. Harrsch are the parents of. nine children, namely: Herman, Anna, Ernest, Richard, Hans, Robert (deceased), Adolph, Margaret and Fred. Mr. and Mrs. Harrsch and family are highly respected in their community, and Mr. Harrsch is a popular citizen, having served his constituents satisfactorily in the office, of county supervisor from 1888 to 1892. William T. Kirk, now living a retired life at Plainview, Nebraska, has been a resident of this state for upwards of forty years. His long and useful life has been spent mostly in the west, on the frontier country, of which he has become thoroughly a part. Mr. Kirk is a native of Mason county, Kentucky, born on November 30, 1845. He is a son of Washington and Amanda (Welles) Kirk, both reared in Mason county, of Scotch descent, although their ancestors had been residents of America since colonial days. William grew up in his native county, and was married there. At the outbreak of the Civil war, he was engaged in farming, and at the call to arms enlisted in Company G, Sixteen Kentucky Regiment, on the northern side, serving for three years with his company. He then re-enlisted under the same command, and saw hard service until the close of the war, being discharged on August 5, 1865. The first two years of his army experience was through Kentucky and Tennessee, and the remainder took him farther south, being under the command of General Schofield, in Sherman's army, in Georgia, North Carolina and Alabama,. He participated in the march to the sea, and before the close of the war, was sent back to Tennessee under Thomas to hold Hood in check. Upon returning from the war, he continued to live in Mason county until coming to Nebraska, about 1871. The family came by train to Byeton, Missouri, thence by stage to Rulo, Nebraska, and there Mr. Kirk and his family made their home for one year, then rented a farm near the town, farming for six years. He disposed of his farm, and purchased a home in Rulo, engaging in the meat business, which he carried on for three years, at that time moving to Antelope county, arriving in the latter vicinity in the spring of 1881, locating on a farm, twelve miles west of Plainview. Two years later he filed on a homestead near by, occupying the place for seven years, then sold out, and retired to Plainview. He has been engaged in the meat and butcher business several times during his earlier residence in Plainview, in partnership with a son, but most of the time has lived a quiet life. He purchased an entire block in Peed's addition to the town erected a comfortable home, and there himself and his good wife enjoy all the comforts and many of the luxuries, free from care, and possessing many warm friends in the community. Mrs. Kirk's maiden name was Mary B. Galt, daughter of Edward L. and Mary (Prather) Galt, old residents of Mason county, Kentucky, whose ancestry goes away back into the colonial times. Mr. and Mrs. Kirk have had the following children, all living, named as follows: Wirter H., editor of the Creighton News, of whom a more extended sketch is found elsewhere in this work; Charles G., a soldier during the Spanish war in the third Nebraska regiment, is now farming; George W., now engaged in the real estate business at Plainview; Joseph W., the youngest son is employed as foreman on a section of the North Western railway. He is owner of a fine farm in Burt county, which he has rented. Politically Mr. Kirk is an independent republican, and a member of the Grand Army of the Republic. Frank O. Seger, residing in section twenty-eight, township thirty, range two, of Knox county, Nebraska, is regarded as one of the leading citizens of his locality. He has always been one of the important factors in the upbuilding of his region, aiding materially in its growth from the time of its early settlement. Mr. Seger is a native of Sweden, having been born in Linckoping province in the year 1856, and is the son of A. P. and Johanna (Satterstedt) Seger, the mother passing to the great beyond when our subject was but a small boy, Mr. Seger received his education in Sweden, growing to his young manhood days there, and served his native country as a soldier in her army for seven years. In 1881, Mr. Seger left his native land for America, sailing from Guttenberg, by way of Hull and Liverpool to New York, on a steamship. After landing on American shores, he first went to New Windsor, Illinois, where he remained two years, and then went to Moline, Illinois, where he worked five years in the plow factory. In 1888, Mr. Seger came to Knox county, Nebraska, and for fourteen years rented land in Dowling township, and in 1902, he bought his present farm of one hundred and sixty acres, where he now has a well-improved place and fine home. Like so many of the earlier settlers of this region, Mr. Seger has experienced many hardships and discouragements in getting a footing in the western country, but perservered in his faith of Nebraska soil and resources. His efforts and perseverance have been crowded with success, as he is now in a position to enjoy life in peace and comfort. Mr. Seger, since his first coming to Nebraska, has been a popular man in his community, which is due, most likely, to his many sterling qualities as a man, and his pleasing, friendly manner. He has held about all the township offices in his community, and has been assessor for eleven years. He is a republican in politics. Mr. Seger was united in marriage in 1877 to Miss Hulda Anderson, and Mr. and Mrs. Seger are the parents of seven children, whose names,; are as follows: David; Charles; Esther, who is the wife of Charles Berg; Elsie, Edith, Ernest and Oscar. Mr. and Mrs. Seger and family are members of the Swedish Lutheran church at Wausa. This gentleman is among the best known residents of Boone county, his successful farming operations being the outcome of many years of faithful labor and judicious management. Mr.
Foltz is one of the early settlers of Manchester precinct, and his elegant farm of two hundred and forty acres, situated one and a half miles north of Albion, is one of the best equipped for stock and grain raising in the locality. Louis N. Foltz was born near Hagerstown, Washington county, Maryland, on June 19, 1848, and had the good luck to be the seventh son of seven sons in the family of Jacob and Nancy Foltz, the former a native of Lancaster county, Pennsylvania, and the mother of Washington county, Maryland. Our subject received his education in the common schools of his native county, and later attended the State Normal School of Pennsylvania, also the normal school in Lebanon, Ohio. In his nineteenth year, he taught school several months, and after attending college for a short time, began teaching in Maryland, and continued for six years, afterwards teaching in Ohio for eight years. Mr. Foltz was married to Miss Mary C. Benchoff in Washington county, Maryland, on the twenty-ninth day of December, 1874. A son was born to them there, and in 1884, the family came to Boone county, Nebraska. Mr. Foltz purchased railroad land on section fifteen, township twenty, range six, and this has been his home since that time, he now being owner of a fine farm of two hundred and forty acres. Here the family have gone through all the changes that have come to Boone county, often experiencing disappointment in the failure of crops, etc., but have finally become prosperous and successful. Mr. Foltz has been identified with the educational progress of his adopted county and state since locating here, being, during a large part of that time, engaged in teaching in the schools in addition to carrying on his farming operations. Mr. and Mrs. Foltz have two children: C. Fred Foltz, born February 4, 1876, who married Lois Barber, lives on the farm adjoining his father's place. They have three children, Catherine, Lucille and Frederick Donald. A daughter of our subject, Lulu B., married Dr. L. T. White on June 2, 1909, and they live in California. Another well-known and highly esteemed old settler of northeast Nebraska is found in the person of the gentleman whose name heads this article. He has made this region his home since February, 1883, coming to Antelope county from Seward county in December, 1885, and during the time he has resided here, he has acquired a splendid property and a competence for himself, and in doing so, he has aided materially in the development and advancement of, the community. Mr. Fox is a native of Indiana, where he was born, October 4, 1838, a son of Jonas and Nancy Fox. Of five children born to his parents, he is the only one now living. His parents and grandparents died within a period of three months, and when Mr. Fox was a small child, he was taken by friends to Cass county, Michigan. It was in 1839 that he went to Cass county, Michigan; and he remained there until 1861. At this time the Civil war broke out, and Mr. Fox promptly enlisted, joining Company A, Twelfth Michigan Infantry. He served through the entire war, and was under General Sherman until Sherman made his historical "March to the Sea." His first battle was at Pittsburg Landing, afterwards participating in battles at Jackson, Mississippi; Vicksburg, Shiloh and Middleboro, Tennessee, besides a campaign with heavy marching in the southwest. He enlisted October 2, 1861, and received an honorable discharge, November 7, 1865, making for himself a creditable war record of four years duration. In March, 1866, Mr. Fox went to Knox county, Illinois, where he resided for four years. Mr. Fox was united in marriage, February 21, 1864, to Miss Emma Drew. Mr. and Mrs. Fox are the parents of three children, named as follows: Frank; Linifred, who is married to Miss Harriet Gatenby; they have two children, Mary and Robert. May, the other daughter, resides at home. Mr. Fox settled in Antelope county, Nebraska, taking up a homestead in section two, township twenty-four, range seven, on which he built a sod house, and lived there two years; then removed to near Neligh, where he rented land, living there nine years, and later bought the land where he now lives, which is located in section thirty-six, township twenty-six, range six. He owns one hundred and sixty acres of good land, and is surrounded in his pleasant home by a host of kind and loving friends and neighbors. Mr. Fox has always been a prominent and popular man in his community, and during the year 1892, was elected to the office of county commissioner, which office he creditably filled to the entire satisfaction of his constituents. Mr. Fox also served as town clerk while living in Elgin township. its members have been well known in various movements for the progress and development of central Nebraska. In his eighteenth year, Ellis W. Given accompanied his parents to Custer county, having previously removed with them to Illinois, and later to Filmore county. He turned his attention to farming, and is one of the prosperous young men of his part of the state. He is a pioneer, and has made his own way, through energy and ability, in his line of work. He now lives on one of the best farms in Custer county, a short distance north of Merna, on the southeast quarter of section twenty-nine, township eighteen, range twenty-one, where he has a large, modern home of eight rooms and bath, besides numerous closets. The house was erected in the fall of 1907, and was occupied in December of that year, Christmas dinner being the first meal in the new house. On Christmas day, 1895, Mr. Given married Kate Jacquot, a native of Illinois, born near Saunemin, Livingston county. She is a daughter of Nicholas and Josephine (Mitchell) Jacquot, pioneers of Custer county. Both parents are natives of Paris, France. The father, when about seventeen years of age, came to America about 1860, and the next year enlisting in a regiment of Illinois cavalry, served through the entire war. Mr. Given and wife have an interesting family of three children, all born in Custer county: Brooks, Ardetta and Robert. The family is active in various public movements, and well known in social and educational circles. Mr. Given was in the fields at the time of the coming of the famous blizzard of January 12, 1888, but soon made his way to the house, where he remained until the storm was spent. Mr. and Mrs. Given are members of the Methodist Episcopal church. In politics he is a democrat, and is a member of the Royal Highlanders. Ralph C. Cannon, one of the younger men among the early settlers of Custer county, is well and favorably known, and a progressive and successful farmer. He is a native of Nebraska, born at Union, December 9, 1877, son of Samuel L. and Lottie T. (Young) Cannon, natives of Missouri and Iowa, respectively, and now living in Broken Bow. He was the third of their five children, and has a brother, Elmer, living in Custer county; two brothers, Cleon and Joseph, living in Broken Bow, and one sister in that city. In his early childhood, the family lived for one year in California, and thence he was brought by his parents to Custer county, and there reached maturity. He was educated in the local schools, and, after reaching his majority, purchased land, and engaged in farming on his own account. On December 25, 1902, Mr. Cannon was married in Custer county, at the home of her parents, to Miss Daisy Thornton, a native of Iowa, who came to the county with her parents in 1884. She is at daughter of William and Flora (Goode) Thornton, who came to Custer county in 1884. The father, a native of Scotland, who came to America in 1863, died March 24, 1902, and his widow still resides on the old home farm in Custer county. Besides Mrs. Cannon, there are two sons, Walter and Frank, and five daughters in the county. Mrs. Cannon was a teacher in the public schools before her marriage. 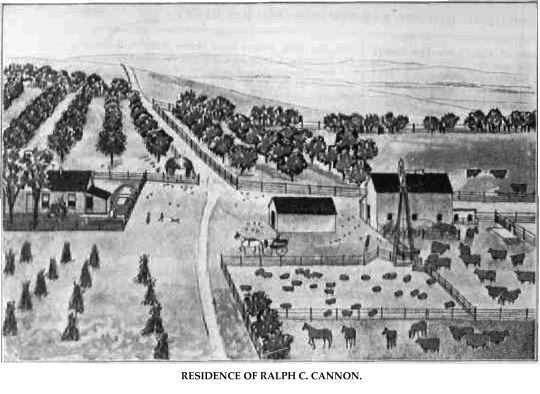 Mr. and Mrs. Cannon now live on his father's homestead, on section thirty-one, township seventeen, range eighteen, of which we are pleased to show a view on one of the illustrated pages. Mr. and Mrs. Cannon have four children, three of whom survive: Mildred, died in 1907; Grace Mabel, Ralph Dean and Samuel Leland. Mr. Cannon is a patriotic son of Nebraska, where his entire life has been spent, and has a good standing in his community, where he is recognized as an enterprising and public-spirited citizen, interested in everything pertaining to the general welfare, and ready to do his part to advance any worthy cause. He and his wife have at wide circle of friends and acquaintances. Mr. Cannon and his brothers were at school the day of the January blizzard of 1888, their father coming for them, and conducted them safely home. Mrs. Cannon, then a little girl, was returning from a visit in Iowa with an uncle. They reached Lincoln, and remained there until the storm was over. Residence of Ralph C. Cannon. Among those who materially aided in the development of the state may be mentioned the Pierce family. They have been in Nebraska since 1878, and consequently took part in the common struggle with the wilderness and the forces of nature, which ended with the triumph of progress and civilization. Two generations of this family have nobly aided their country in time of war. The elder Pierce, now, deceased, was a veteran of the Civil war, having enlisted in February, 1865, in Company H, Forty-seventh Wisconsin Infantry, serving seven months. Falling in from exposure, he returned home on a hospital boat, after the close of the war. The son, George, was a member of Company B, Second Nebraska Volunteers, in the Spanish-American war. He contracted fever at Camp Chickamauga, and, after transfer to the hospital at Omaha, was a convalascent there several months before being strong enough to return home. was about eight years of age, when the family moved to Cattaraugus county, New York. He learned the trade of blacksmith here, and in 1851 returned to Cortland county. Four years later, he joined the movement to the west, and went to Rock county, Wisconsin. On January 27, 1857, he was married in Clinton, Rock county, Wisconsin, to Miss Sarah E. Northway, a native of Cardif, Onondaga county, New York, a resident of this vicinity. Her parents, Dyer and Abagail (Kirk) Northway, lived in Syracuse until about 1850, when they moved to Rock county, Wisconsin, when Sarah was about twelve years of age. Mr. and Mrs. Pierce made their home in Wisconsin for many years, but in May, 1878, Mr. Pierce chartered a car through to Grand Island, Nebraska, and loaded in their household goods, farming implements, teams and stock, and, with his son, Louis, started for the west. The remainder of the family joined him in June, on the farm he purchased, in Springdale township, on the north side of Loup river. Here he resided, giving his time and attention to the cultivation of his farm, and the raising of fine stock, up to the time of his death, which occurred on the twenty-second of January, 1906. The old farm is still in the hands of the Pierce family, being now the residence of the son, Louis D. Pierce, with whom the mother makes her home. Mr. Pierce was an ardent republican, and was a local leader in his party, and, although he would never accept political preferment, he was always a prominent worker for the party's candidates and cause. State and national officials always sought his counsel in local matters, and his influence helped other men into coveted public office. The younger son, George, was married in North Loup, Valley county, on the thirteenth of April, 1904, to Miss Nora Miller. He was a resident of Valley county from 1888 to the time of his death in November, 1908, with the exception of a year spent in California. His wife and two children, Merrill and Mona, are residents of Ord. The older son, Louis D., was born in Rock county, Wisconsin, on November 10, 1861. He lived in Wisconsin until he was seventeen, when he made the memorable trip to Valley county with his father. He was married in New York state on December 26, 1888, to Miss Mary Curtis, a daughter of Luther and Wrexaville (French) Curtis, both of whom died in New York. Mr. Pierce and his bride made their home in Nebraska until 1891, when they removed to New York, residing in that state until 1909, when they again came to Valley county. They now live on the old farm in section twenty-six, township nineteen, range thirteen, of which we show a sketch on another page. The dwelling, perched on a hill gives a commanding view of the North Loup and the valley, and is known as River View Farm. Mr. and Mrs. Pierce have three children, Luther D., Dorothy Curtis and Abigail Northway. Mr. Pierce joined a party of Burlington surveyors while they were employed in Valley county, and spent a year with them, from the spring of 1887 until the spring of 1888, locating the lines of the road in the Black Hills. The first five years in Nebraska, the Pierce family lived in a large log dugout, which was known far and wide as the best furnished and best kept dwelling of the kind in all the Loup country. This is also a subject of illustration in our work. There were many deer in the valley when the family first settled here, herds of them sometimes being seen from the door. 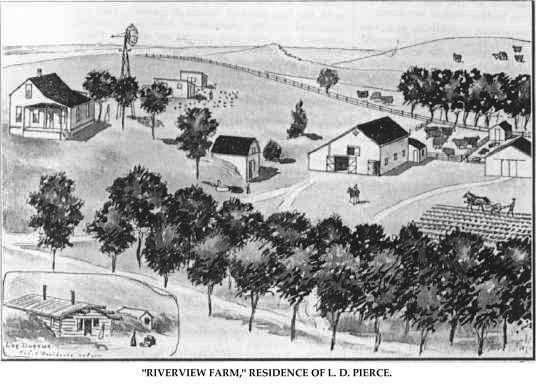 "Riverview Farm," Residence of L. D. Pierce. Martin H. Leamey, one of the leading members of the Pierce county bar, first came to Plainview, Nebraska, early in August, 1887, to become superintendent of the Plainview schools, which were under his efficient management for two years, after which, for two years more, he continued to teach in the county. He then, in April, 1891, became cashier of the Bank of Plainview and remained in that position until December, 1894. At that time, he went to Omaha, and entered the law school there, became connected with the law office of Brome & Burnett, and was admitted to the practice of law in Nebraska, January 25, 1895, and opened an office in Plainview in November of that year. From January 1, 1897, to January 1, 1899, he served as county attorney. In December, 1899, he removed to Blair, Nebraska, and two years later to Allentown, Pennsylvania, where he remained in practice four years. He next located in Clark county, South Dakota, and in 1906, returned to Pierce county, since which time he has been giving strict attention to his growing practice at Plainview. On March 1, 1910, he removed to Pierce, succeeding to the practice of W. W. Quincy when the latter removed to western Nebraska, adding that clientage to his own. Mr. Leamey was born at Gardener, Massachusetts, November 10, 1860. He is a graduate of the high school at Petersham, Massachusetts, and Eastman's Business College at Poughkeepsie, New York. He also took a course at Campbell Normal University at Holton, Kansas, and the Western Normal at Shenandoah, Iowa. He taught one year each at Princeton and Petersham, Massachusetts, before coming west. His parents, Michael and Honora (Harty) Leamey, were natives of Ireland. gan, respectively. The grandfather, Moses Stocking, was one of the earliest pioneers of Nebraska. Four children have been born to Mr. and Mrs. Leamey, whose names are as follows: Mary, Harold, Florence and Manota. Mr. Leamey is an independent republican in politics, and is a member of the Independent Order of Odd Fellows lodge at Plainview. Our subject was teaching in Nebraska during the severe blizzard of January 12, 1888, and was prudent enough to keep the children at the school house all night. Though they might be hungry, they were kept safe and warm. There was intense suffering and many deaths all over the west in this storm, because of the lack of forethought to remain indoors. Prominent among the self-made men of Howard county, Nebraska, is the gentleman above named, who is a prosperous farmer and stockman of Dannebrog precinct. His farm is situated on section thirty-three, and is improved with a good residence, farm buildings of all kinds, and other improvements that go to make up a model country place. Niels Jensen is a native of Denmark. He was born February 1, 1842, and spent his boyhood there. His parents spent their entire lives in their native land, dying there quite a number of years ago. In 1872, our subject came to America, his first location being in Racine, Wisconsin, where his brother, Johan Jensen, had settled a short time before, and he spent six years in that locality, working as teamster, etc. In the spring of 1878, Mr. Jensen and his wife came into Howard county, Nebraska, where the former purchased eighty acres of railroad land. He erected a rude shanty, and began to develop a farm, which for quite a long time was very uphill work, as there were no conveniences in the way of machinery, the seasons were often dry, and crops would not do well, and they saw much hardship and privation before they were able to make any headway, barely being able to make a living for themselves. However, as conditions became more favorable, Mr. Jensen was able to accumulate considerable property, occupying the original homestead since first coming here, besides purchasing other land, all of which he has put in first-class shape. He now owns two hundred acres, all in Dannebrog precinct. Mr. Jensen was married at Racine, Wisconsin, to Carrie Rasmussen, and of this union one child was born, both mother and child now being dead. In June, 1882, our subject was married the second time to Dorothy Caroline Jorgensen, and to them have been born six children, namely: Kornerup, Harriett, Elinor, Joshua, Ebbe and Adelaide. They are all bright and intelligent young people, the two eldest daughters being, teachers in the public schools of Howard county. The family have a pleasant home and a large circle of friends in their. community. William H. H. Ramsey, retired farmer, who resides in Ord, Nebraska, where he has a pleasant home, and is surrounded by a host of good friends and acquaintances, is a son of John P. and Eliza (Garison) Ramsey, and was born in Bergen county, New Jersey, February 13, 1840. He was fourth in a family of eight children, and has one brother living in Pennsylvania, two brothers and three sisters in New Jersey, and one sister is deceased. The parents were of German descent, the father having died in 1883, and the mother passed away one year later, in 1884, both deaths occurring in New Jersey. Mr. Ramsey grew to manhood on the farm in his native state, and when seventeen years of age, was bound out for three years to learn masonry, and followed his trade thereafter for a number of years. On August 2, 1861, he married Sarah L. Williams, who was born in Rockland county, New York state. On April 26, 1864, Mr. Ramsey enlisted in Company A, Fifth New Jersey Infantry, serving until close of war. He received his honorable discharge, November 28, 1865, in New York City, with a creditable war record of his year's service. He participated in the battle at Cold Harbor, where he was wounded and unfitted for field service. Later he did duty at Castle, Garden, New York, and was then made warden in the hospital at Fort Schuyler, New York. After the war, he returned to his home in New Jersey, working at his trade until a few years later, when he moved to La Grange, Michigan, engaging in mercantile business for nearly six years. In the fall of 1877, Mr. Ramsey came with his wife and six children to Valley county, Nebraska, homesteading one hundred and sixty acres, also pre-empted one hundred and sixty acres adjoining, which remained the home place for over thirty years. This farm was located on the northwest quarter of section thirteen, township nineteen, range sixteen. Eight children have been born to Mr. and Mrs. Ramsey, namely: Mary, wife of J. H. Capron, they having two children, and reside in Ord; William, who is married, lives in Ord, and has two children; Truxton, married, has three children, and lives in Idaho; Margaret, who is the wife of J. A. Wentworth, resides in Ord, and has four children; Angeline, wife of Ernest Orcutt, has one child, and lives in Ord; John, who is married, also has one child, resides in Ord; Edna, wife of Charles Jackson, lives in South Dakota; one daughter, Eliza, died in infancy. The Ramseys are among the settlers of Valley county, and are widely an favorably known. Mrs. Ramsey's father, Truxton Williams, lives in Rockland county, New York, at the advanced age of ninety-one years. Her mother, Angeline (Springsteen) Williams, died in 1897, in New York state. Mrs. Ramsey has one brother residing in Jersey City, New Jersey, and another brother and one sister are residents of New York state. Mr. Ramsey is a prosperous, successful man of affairs, owns a fine four-hundred-and-eighty-acre stock farm in Noble township, Valley county, this being a well-improved and equipped farm. He also owns considerable western land in Colorado and Idaho. In 1904, Mr. Ramsey retired from the farm, and moved to Ord, where he built a good home, where they now live, although they make their summer home in Idaho, near the Hot Springs. Among the men who have helped in the development and success of northeastern Nebraska, the gentleman above named occupies a prominent place. He has built up a pleasant home and good property of five hundred and sixty acres in Madison county, where he resides on section five, township twenty-two, range two, west. For the past twenty-seven years, Mr. Giltner has been closely identified with the development of Madison county, and his labors to this end are welt known to all in his community. Mr. Giltner is a native of Bourbon county, Kentucky, his birth occurring March 1, 1854. He is a son of Martin and Martha (Penn) Giltner, who were also natives of old Kentucky. Mr. Giltner comes from a good family, both on the maternal and paternal side. Henry Giltner, our subject's great-uncle, was the first Presbyterjan minister to hold services in Nebraska. On the maternal side, Mr. Giltner can trace his ancestry back to William Penn, a fact of which he is justly proud. In April of 1883, Mr. Giltner came to Nebraska from Marysville, Missouri, making his entry into the state by mule team, he having driven the entire journey by this means. After arriving in Nebraska, he purchased the Alden Dudley homestead. He has steadily improved this land, until now he has a good farm and home, where he is surrounded by many good friends. During his several years of residence in Madison county, Mr. Giltner has experienced the many hardships that beset the early settler in this region, and as late as 1894, the crops, as well as all vegetation of every description, were destroyed and burned by the hot winds that were the result of the terrible drouth that prevailed during that season. November 2, 1880, Mr. Giltner was united in marriage to Miss Fannie Wherritt, a native of Missouri, and daughter of Sidney and Annie Wherritt. Mr. and Mrs. Giltner are the parents of four children, whose names are as follows: Mayme, Martha, Josie and Bessie. Mr. Giltner is one of the substantial citizens of northeastern Nebraska, and is always keenly interested in all pertaining to the best interests of his home state and county. He is a democrat, and a member of the Presbyterian church. FLAVIUS JOSEPHUS GREER, M. D.
Dr. Flavius Josephus Greer is an early Nebraskan, and one who has passed through the trials and vicissitudes of pioneer life. He is one of the best known men in Custer county, and has long been identified with its progress and development. He was born in Carroll county, Ohio, October 22, 1841, youngest of the nine children of George and Sarah (Lee) Greer. The father was born in Maryland, of German ancestry, and the mother was born in Ohio, of Irish extraction. Both died in York county, Nebraska, the father in 1895 and the mother in 1877. But three members of the family now survive: Miss Mary Greer, of Callaway; W. H. Greer, of Forest Grove, Oregon, and Dr. Greer. Dr. Greer was reared on a farm in Ohio, receiving his elementary education in the public schools. Later he was a student in Harlem Springs, Ohio, and still later studied medicine. He was married at Springfield, Ohio, May 5, 1863, to Sabina J. Noble, a native of Carroll county, and daughter of David and Sarah (Powell) Noble, the father a native of Payette county, Pennsylvania, and of Irish extraction, and the mother a native of Pennsylvania, of German extraction. Both died in Carroll county, he in March, 1875, and she about 1883. Mrs. Greer has a sister and two brothers in Carroll county, and her brother, Barzilla, is living on the home farm, which was obtained by his parents from the government in 1832. Dr. and Mrs. Greer established their first home in their native county, where they lived until April, 1866, when they went to Rome, Iowa, and there he opened up his first office for the practice of his profession. In May, 1871, he made a trip into Nebraska, looking for a suitable location, traveling from Lincoln to Seward on the first train that passed over the Burlington railroad there. He filed an entry on one hundred and sixty acres of land, which he entered as a pre-emption. This place was located ten miles northwest of York, on Lincoln creek. Soon afterward, he returned to Iowa, and, although he made subsequent trips to York county, it was not until January 31, 1873, that he came with his wife and children to establish a home there.